I’ve never paid much attention to Casio in the past, admittedly. While Panasonic was the microwave maker that defied conventions, Casio pretty much made the kind of digital cameras (generic, 3x zoom ultracompacts) that you would expect a watch maker to make. Casio seems to have poured some serious R&D into high capture rate sensors (and image processors), which first saw the light of day in the groundbreaking EX-F1 ultrazoom, which could capture full-resolution 6MP images at 60fps, and very reduced resolution video at a whopping 1200fps. Casio now manages to cram that same sensor and processing technology into two itty bitty ultracompacts: the 0.9in FC100 with 37-185mm (5x) lens and the 0.6in (!) FS10 with 38-114mm 3x lens. 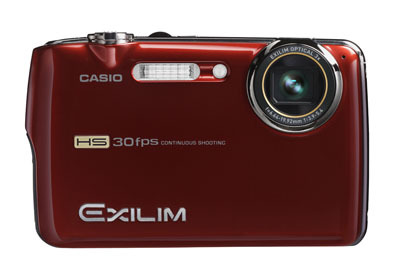 Both cameras can take 6MP frames at 30fps. What’s more, the camera is in effect constantly recording still images at this framerate – at the moment you press the shutter, you not only start taking frames, but 25 frames in the preceding moments are also saved as well, allowing you to in essence go backwards in time to grab a frame that you couldn’t react to in time. As with the EX-F1, both compacts can also record up to 1000fps in a heavily reduced resolution movie mode, with an electronic shutter providing effective shutter speeds of 1/40,000s. As surprising as this is coming from Casio, which seemed like a company that didn’t care much for innovation in its early attempts at digital cameras, it’s refreshing and downright exciting to see a manufacturer embrace all the potential of digital electronics for photography purposes. At the framerates that Casio’s cameras are working at, the entire concept of “timing” could be thrown out the window – simply record continuously while the camera’s on, and look back later to pick out the frame and perfect timing. Electronic shutters also provide the potential for unimaginably quick exposure times that could never be possible with mechanical shutters, enabling stroboscopic-like freezing of action, without having to actually rely on strobes. The big obstacle here (aside from memory buffer size and storage space, which should catch up in due time as it seems pixel count is starting to plateau) is coming up with an easy interface to facilitate the still frame selection process from a huge, continuous stream of recorded images. For now, especially given the limited sensor size, and resolution limits, Casio’s cameras mostly remain mostly confined to technical experimentation rather than real professional use. But it’s not hard at all to imagine such a system, built into a high-quality, interchangeable lens system, to have a huge impact on photojournalism and sports photography. Of course, this kind of technology and SLRs are mutually exclusive, since the sensor relies on a constant light feed that an SLR’s mirror diverts to the optical viewfinder. If Casio were smart, it’d grab its unique sensor technology to blow the professional PJ and sports fields wide-open. Perhaps Samsung’s NX system, and the recent declaration that the system will be open for licensing to third-party body manufacturers, provides just such an opportunity.